The Vintage Rose07584 576227work Tea/Coffee ShopThe Vintage Rose is a vintage style tea room located at Quest Place just off of Maldon High Street. At the Vintage Rose we have always had a passion for vintage and love using all our vintage/antique china. We've tried to create a nice homely feel in a quaint setting. All our cakes are homemade by ourselves with Gluten free option always available. Our food is freshly prepared including soups and scones. We offer light lunches (sandwiches, Panini’s, toasties, salads and jackets as well as our popular afternoon tea with no need to book. We can cater for all dietary requirements from gluten free, dairy free and vegetarian, just give us a cal. We also have items to sell from small local businesses. As well as paintings and pictures. 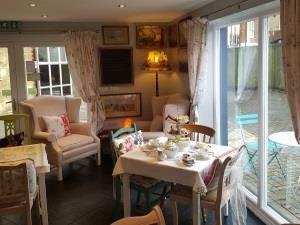 The Vintage Rose is a vintage style tea room located at Quest Place just off of Maldon High Street. At the Vintage Rose we have always had a passion for vintage and love using all our vintage/antique china. We've tried to create a nice homely feel in a quaint setting. Open Mon - Sat 9.30-4.30pm. We are open some Sundays, please call to enquire.